Can You Have A Bonfire in Your Garden? Legally, yes you can. However, you should be mindful of your neighbours, they may not want clouds of smoke billowing into their garden. It is particularly important to consider what you are burning - burning wet leaves or garden rubbish will make the smoke rather unpleasant. Materials such as plastic and rubber, as well as some types of wood (chipboard) or MDF can give off toxic fumes. Never use flammable liquids or put aerosols on the fire, as they could explode. This is the same reason you should never put spent fireworks on your bonfire. Allow appropriate space for your guests to watch safely. Ensure there is a quick route of exit in the event of anything going wrong; any pathways or walkthroughs should be kept clear so guests are not cut off once the bonfire is lit. Consider the location of your home. Are you near any shrubs or trees that can be burned, damaged or set fire to from being too close to a bonfire? Sheds and Summerhouses are great places to provide food, drinks, seating and shelter for your guests. But, they can be easily damaged through radiant (or direct) heat. We recommend leaving at least 5m between a bonfire and any garden structure. (Note. this is an absolute minimum recommendation and will depend on the size of bonfire). Take careful note of the weather, especially wind and the direction it is blowing - sparks or burning embers can drift on the wind and start a fire. Be mindful of children or adults who are asthmatic - suggest they stand away from the bonfire slightly to reduce smoke inhalation. Unfortunately, over half of all firework accidents in the UK happen to children. Anyone under the age of 18 must be under constant supervision when near fireworks to ensure they are kept safe. It is also essential for children to have sufficient ear protection while watching fireworks to keep them safe from the loud noises. Under 18’s are allowed to use sparklers. However they should always be under close supervision and wearing the correct protective clothing. 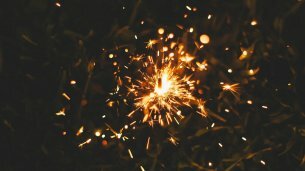 Always remember, it’s the responsibility of an adult to make sure there is a bucket of water or sand handy to extinguish the sparklers and that no child under the age of 5 is given a sparkler. After your bonfire party has finished, it is important to take the time to thoroughly soak the embers, this will make sure there is no chance of them reigniting. Pets can get become very anxious around Bonfire Night, as they don’t understand the reason for the loud bangs and flashes. To keep your pet calm this year close all windows and doors, as well as blinds and curtains to minimise the impact. You may also want to turn on the television or radio to distract them or mask some of the noise. Finally, ensure they are microchipped and are in a secure location, as the fear they may experience could cause them to try and escape. Some people help their pets to become more used to bangs. They do this through playing YouTube videos of fireworks on a low volume in the weeks or days before 5th November to help desensitise them. It is important that you do not make a fuss or bring the noise to the attention of your pet - stroking and petting them to calm them can actually reinforce the fear as, by trying to comfort them, you are demonstrating to them that it is something to be feared. Just go about your business as normal and, as the pack leader, it will show to your pet that there is nothing to be afraid of. Even if you built the bonfire the day before, you should recheck it again with a torch before you light it; hedgehogs and other wildlife such as frogs, toads or newts may have decided to make it their home. You should move them carefully to a safe distance out of harm's way. Fireworks are expensive and it can be tempting to cut costs when purchasing them. However, you should only purchase fireworks from reputable retailers. Be on the lookout for the BS 7114 label, as this confirms the fireworks comply with the latest British standards. For category 2 fireworks (or garden fireworks) this is 5-8 meters from the firework zone and for category 3 fireworks this goes up to 25 meters, so consider your garden space and be aware of the category when buying. 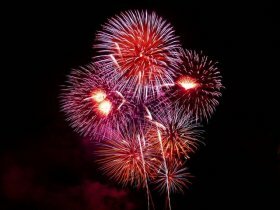 Get more information on firework classifications here. Before attempting to light fireworks, always read the instructions. This will tell you both how to light them (at arm’s length with a taper), what environment they are suitable for (classification), how to store them (this will usually be in a closed metal box far away from heat sources), as well as what to do should your lit firework not go off (never approach). You must always follow these instructions! Excluding the hours 11pm - 7am all year round. Ensure you have a torch, a bucket of water or soft earth, lighting taper or non-flammable flat surface for flat-bottomed fireworks, and suitable supports for Catherine wheels or rockets during the day of your firework party, while it’s still light. If you follow these instructions you should be well on your way to an enjoyable and safe Guy Fawkes Night! If you have any questions or queries about fire safety, do not hesitate to contact your local fire department who will be more than happy to help. Our bespoke Garden Buildings are perfect for watching the fireworks, a fantastic example of this is our Morston Summerhouse. It has a spacious veranda for you to relax in and gaze as the sky is lit up. All of our garden buildings are hand-crafted by our expert team, then delivered and installed free of charge. You can see our extensive collection and get advice from the team when you visit one of our seven UK Show Centres. To get in touch with the team you can also Request a Callback, Contact Us or call 01760 444 229.